There wasn’t much I could do with Audrey in my network “closet”, so I retired the old girl this weekend. I figure that I’ve gotten my seventy dollar’s worth in the four years I’ve owned it, so it doesn’t hurt too bad. 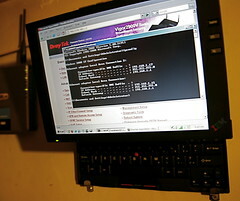 In its place, I installed a 2001 vintage IBM ThinkPad Transnote. The last time I tried to start this ill-fated piece of technology was over a year ago and it wouldn’t boot. It seems that a deep battery run-down solved its OS problems; this time Windows 2000 started without a hitch. I knew I’d never be able to wall-mount this goose-necked, touch-screen marvel unless I were able to take off the portfolio cover and paper pad assembly. There are a number of screw covers and tiny screws around the periphery of the case, which I removed. The faux-leather binder and paper pad came off easily. After disconnecting the notepad cable, I connected the battery, plugged it in, and crossed my fingers. The stand-alone tablet booted without a hitch. 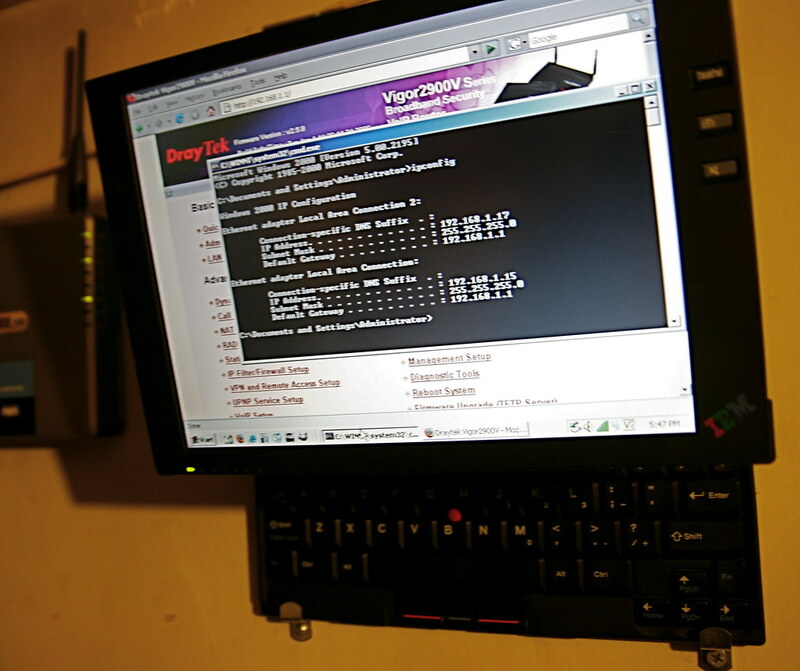 I was able to use Audrey’s mounting hardware (a $1.29 set of “heavy duty” mirror mounting brackets) to attach the ThinkPad to the wall. The battery life isn’t great, but I can take it down anytime I need a wireless Windows machine (to test a Web site in IE6 or whatever). Additionally, I loaded it up with free software (Gimp, iTunes, OpenOffice, Arachnophelia, etc), so it’s actually a pretty competent little bugger. And jeer all you want, but at just over 3/4″, this thing is as thin as a Macbook Air.